Special thanks to Grand Central Publishing for partnering with us to make this giveaway possible! For a certain slice of Millennials like myself, Jason Bourne is the ultimate badass of the decade spanning 2000 – 2010. Watching Matt Damon as Jason Bourne, his memory a blank but nonetheless knowing how to evade hit squads, navigate a foreign city, and fight to the death was totally fresh. I came away from The Bourne Identity wishing I would wake up in Marseille without my memory but with his skill set. Bourne was more than a flimsy action hero, however. He tapped something universal. His story is, essentially, a coming of age tale: Boy wakes up with only a hazy sense of identity; boy meets girl; boy slowly discovers who he really is and what he’s capable of. It’s a version of what we all go through, albeit much more gradually and with fewer car chases (more on that later). Jason Bourne of the movies, of course, is based on the character created by master thriller writer Robert Ludlum. Ludlum penned the first three novels before perishing in a mysterious fire in 2001. The banner has been picked up by Eric Van Lustbader and spun into a further eleven novels, with the newest entry being The Bourne Initiative. A lot has happened to Jason Bourne in 14 novels and fans of the film franchise may not recognize him so easily. Bourne has (surprisingly) made a handful of close friends, (unsurprisingly) accumulated a lot of enemies, and extended the map of his adventures all over the globe. But some things will be reassuringly familiar. In The Bourne Initiative he’s still on the run, this time from US Government hit squads and Russia’s FSB and the Russian mafia. His enemies include a Somali criminal mastermind who enjoys tearing out the throats of his enemies with his teeth and a master hacker running an unacknowledged cyber black ops team. Bourne’s allies include a recently assassinated Russian spymaster, who appears to be reaching from the grave to help him, and a deadly, unbalanced femme fatale who goes by the Criss Angel-adjacent nickname Angelmaker. Add to the mix a Wikileaks-style organization (penetrated by the FSB, naturally), a cyber weapon discovered on the Dark Web and The Bourne Initiative feels very much of the times. Another aspect of the novel that feels relevant: whether someone’s a good guy or a bad guy depends a lot on the personal choices they make, not which “side” they’re on. Jason Bourne has had quite a career on the page and the screen. Here’s awesome, important lessons we can learn from the original amnesiac hit man super spy. 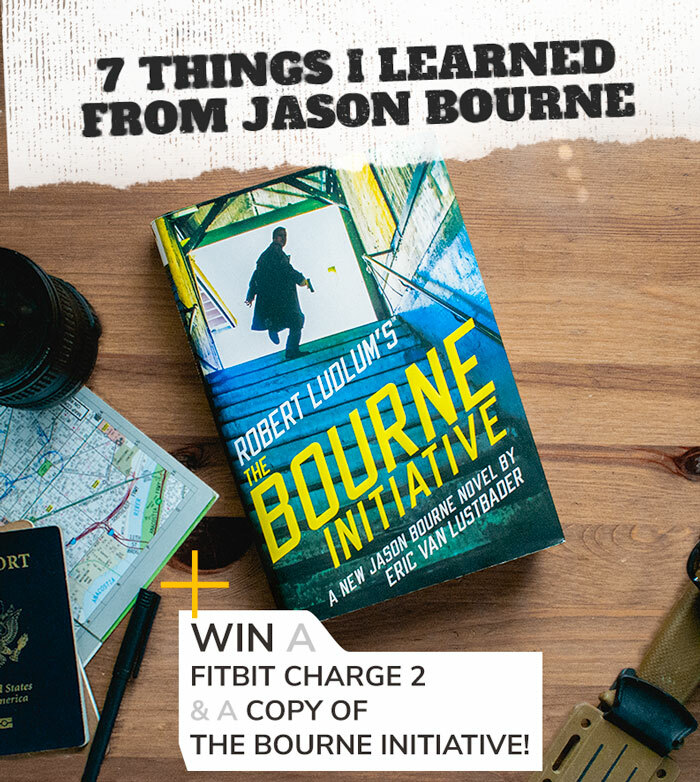 But first, enter to win a copy of The Bourne Initiative and a FitBit Charge 2! Jason Bourne is the embodiment of the classic survival adage: keep making decisions, even if they’re the wrong ones. In a survival situation, especially where hypothermia or a caloric deficit are in play, it’s all too easy to just sit down, let despair set in, and freeze (or starve) to death. Bourne never stops moving and never stops making positive, decisive decisions. It helps that some highly trained gun thug is always chasing him, but the lessons stands. Bourne’s ability to read a room is remarkable – he sees what others don't, and it makes his powers mage-level. While Bourne certainly gets a leg up from Hollywood, what he’s doing is practiced by countless first responders, soldiers, and real spies: situational awareness. Most of us go through life with a very narrow beam of attention. Growing your situational awareness means widening that beam, especially in crisis situations. Check out our piece on How to Be a Leader in an Emergency for tips from a psychologist and a firefighter. The The Bourne Supremacy arguably contains the best car chase in the film franchise, culminating in his enemy’s Mercedes G Class t-boned on a jersey barrier. What does Bourne do after this gruelling smash up? Actively bleeding, he walks away from his stolen Volga 3310 taxicab and continues to evade Russian police. Again and again, Bourne is beat up but continues to function, pushed on by adrenaline, willpower, and a high level of fitness. Here’s the thing: whether you’re an avid Crossfitter or a casual weekend warrior, your body can do more than you think it can. I remember this lesson every time I’m in a long workout and my brain starts screaming “stop! !” Sometimes you have to trust your body when you can’t listen to your mind. There’s always more gas in your tank. Learn how to use it wisely and safely. Who can forget that classic scene in The Bourne Identity: Bourne locates another Treadstone agent in Munich and confronts him in the baddie’s spotless Ikea kitchen. A brutal fight ensues, with the baddie grabbing a kitchen knife and Bourne wielding a rolled up magazine. It’s classic, badass, and very useful for the next time you confront a punk at the dentist’s office. Just grab that copy of Redbook and extend your reach a full 8 inches. The magazine trick leads us to another of Bourne’s most enduring lessons: the power of improvisation. Bourne is a bit like a super serious MacGyver. He uses what’s on hand to get the job done and pivots to a new plan when conditions change. Improvisation is a powerful tool, both for your life and your brain. It’s been shown to help with anxiety and boost creativity. For some every day inspiration, check out this list of MacGyver-style tricks from Lifehacker. Bourne's quests are driven by something profound: regaining his memory of his true self, before he was broken down and reshaped into the perfect human weapon. It's an elegant metaphor for what we all have to do in our own lives: shape an identity that feels authentic and powerful while navigating myriad influences, including family, friends, culture, and art. Bourne's nemeses are always angling to cover something up in order to hide their misdeeds and save their own skin. And while people in the real world are seldom as nefarious, everyone moves through the world doing their best to represent their own interests. This is especially relevant in career and work, and when it comes to dealing with bosses. If you have a difficult supervisor, ask why – are they simply stressed out? Or do they view you as a potential threat to their job? If you have a positive, generous work mentor, you should still ask how they benefit from the relationship. Are they grooming you for a role you want, or one that benefits them? When they give you that special assignment is it to help develop your career…while letting them take off early? That’s not to say you should be Bourne-level paranoid, but understanding the motivations of the people around you can help you see the whole picture and stay one step ahead. 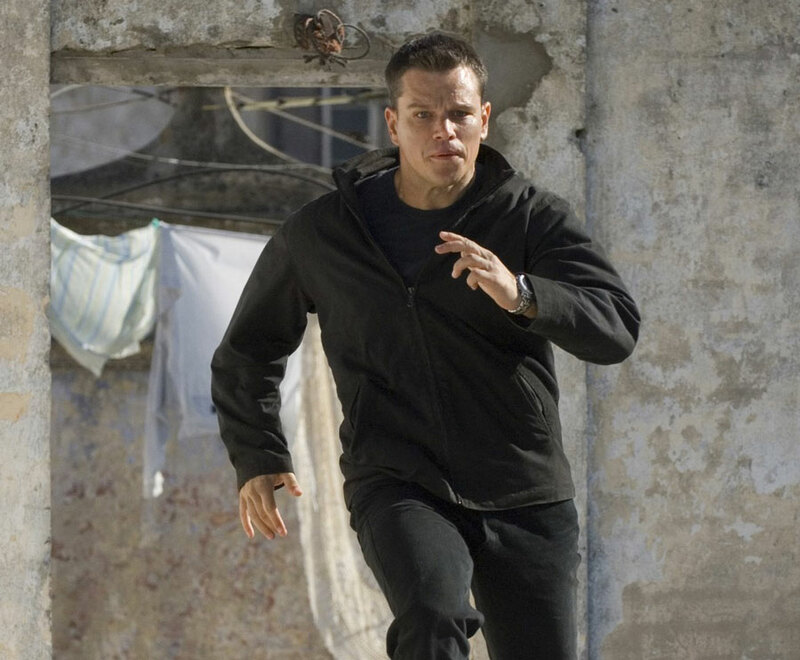 What lessons have you learned from Jason Bourne? Let us know in the comments below! The Bourne series is my goto movie when the wife and I want a decent action movie. I’ve never read the book that inspired the movie series, so it should be a good read. Great action movie, it set the standard that was eventually used and built upon by the Daniel Craig Bond films. I love a good action story. Oh, the intrigue! Gotta love a good action flick! I loved the Bourne series because it depicts to some degree what is going on right now in society. Bourne has to find his identity in spite of what a lot people would: their job or the relationships that they are in. Never read the novels. Going to give them a try! Couldn’t agree more. The Bourne movies built the raw action and improvisation of fight scenes foundations that many action movies stand on still today. Excellent films! great movies that had believable yet amazing fight scenes. I think you described it well. It’s amazing what your body can do when needed. Even those of us not 100% in shape (I hover about 60…) can do some eyeopening stuff depending on the situation. The Bourne movies are just perfect, streamlined action films. I read a good many of the books when I was a teen, I will definitely be considering picking the series back up again! I’ve only seen the films, if I want to read some of the books should I start from the beginning or can I hop in at a specific point? Great article as always! Bourne is the best. I love Jason Bourne both in film and print versions! I learned that the amount of camera shake in these movies will make me nauseous if I watch them in a theatre. It’s better on the small screen, I don’t get motion sick. I haven’t had the pleasure of reading the books, but I have enjoyed the movie series. I think what draws me most is the situational awareness, try as I might, I forget license plate numbers mere seconds after trying to memorize on, let alone being able to recall it several minutes later. Loved the article. Jason Bourne is right up there with James Bond and The Matrix series as my favorite movies of all time. I have all of them on my computer in digital form and have probably watched them all at least a couple of dozen times over the years. BTW, your link to the “rolled-up-magazine fight scene” is incorrect. The link takes you to the “bic-pen-vs-knife” fight scene from the first movie. Which is fine because it illustrates your point just fine. I’ve been wanting to start reading this series, would love to have a copy of the new book. Similar to how Nirvana put to bed hair bands in the 80’s, Bourne put James Bond to bed. While Bond bounced back, Bourne is still my favorite. Loved the Bourne movies and books. Forever changed action movies for the better. The filming job to show Bourne remember skills, i.e. muscle-memory, in the first movie was done so well. Haven’t read the books before, but that’s about to change. Always loved the Bourne movies. One of my very favorite trilogies. Non-stop action! Bourne is consistently exciting! and dependable as a series. Good ideas drawn from a great movie! It was the 2nd wife that did him in. I think my favorite thing about the three main Bourne books are how in debth Ludlum goes into the way Jason thinks. His actions always have a distinct way of relating back to not only the situation at hand, but like you mentioned in your article, relating back to the full picture – situational awareness. I just think the series always keeps you on the edge of your seat because it’s just a great story filled with a ton of action, so really what guy isn’t going to like it? The best thing about the Bourne series is that despite aging Bourne keeps getting better. I think that’s reflective of life. You can continue to improve and get better. Love the movies, just started reading the novels. Good stuff here. Who doesn’t like a good revenge story? I’ve only read the original 3, but I really like how they showed that even a hardened soldier like Bourne, isn’t invincible. He’s still David Webb. I love action movies/books so the Bourne series is right up my alley. I’ve seen most of the movies. I like the suspense and action. Creative, enthralling, and genre-changing. Many props to the Bourne series. I loved the first 3 books, but the fourth, not written by Ludlum was terrible. The fourth book made Bourne a victim of circumstance. The Bourne series just always keeps you on your toes. You never know how he’s going to get out of a bad situation. But of course he always does. I love the action and the characters! The books are easy to get into and enjoy. I have to say action as well. I am not that big into action movies but always enjoy these movies.